William Langland likely wouldn't know what to make of the latest way people are reading his poetry. In part, that's because Langland died in 1386. 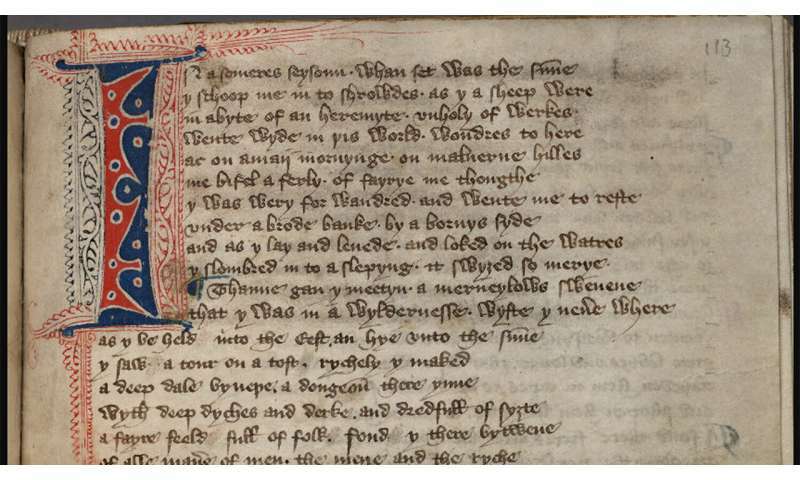 But it's also because his most famous work, Piers Plowman, is the subject of an expansive digital humanities project – allowing scholars to work with multiple versions of the poem using modern tools. Several researchers from NC State, in collaboration with medieval literature scholars from several other institutions, helped bring a new edition of Langland's work to the public last year. Tim Stinson: Piers Plowman was written late in the 14th century by William Langland, a man about whom we know little else. It is inarguably one of the most important works of English literature from the medieval era. Of its time, only Chaucer's work has had a greater impact on later literature and thought. To judge from the numbers of surviving manuscripts of Piers Plowman and The Canterbury Tales, it is likely that both Langland and Chaucer were equally popular in their own day, and Langland's work enjoyed a substantial and influential afterlife. It was frequently recopied in the 15th century and printed in four editions during the 16th century. At that time, one might say that Piers Plowman was rebaptized as a proto-Protestant poem. Reformers believed that the poem's arguments anticipated, and perhaps even hastened, the advent of the Reformation in England. The poem was known and loved by authors such as Spenser, Milton and John Bunyan. One of the poem's most prominent editors and interpreters, E. Talbot Donaldson, has said that Piers Plowman's "extraordinary sweep and intensity … make it one of the greatest religious allegorical poems in English, rivaled only by Spenser's Faerie Queene." TA: People refer to an "A version" of Piers Plowman, and a "B version." What's the distinction? TA: Earlier this year, the University of North Carolina Press published Piers Plowman: The B-Version Archetype (Bx). What is an "archetype" in this context? And what does "Bx" mean? Basically, what sets this edition apart? Stinson: As with almost all medieval texts, we have no manuscript copies in the author's original hand. And as is typical with literary manuscripts of the time (before the invention of printing), the poem underwent many changes, both accidental and intentional, as copies were made from copies down through the years. We refer to an "archetype" in this context as the no-longer extant manuscript from which all other copies of the B-version of Piers Plowman descended. "Bx" is just a shorthand way of referring to the B-version archetype. It is customary to assign one- or two-letter identifiers, called "sigils," to manuscripts when editing them. So "Bx" is a sort of shorthand that follows that tradition. This edition differs in that it seeks to recreate the archetype – that manuscript copy at some remove from Langland's original, perhaps, but the immediate predecessor of what does survive today – rather than the author's original, which the editors demonstrate to be a more realistic goal. It also differs in that it is the first major critical edition of the poem to be designed for digital publication (see http://piers.chass.ncsu.edu/texts/Bx). It is linked to documentary editions of individual manuscripts and features advanced tools for navigating the poem. The printed edition from UNC Press is derived from the digital text, which also sets this edition apart – it is a fluid, multifaceted edition, offering a number of different ways of reading, interacting with, and studying one poem. Stinson: What strikes me the most is that this represents a new way of interacting with medieval textual traditions. What editors find when they begin work of this sort is often a messy set of unclear, and at times contradictory, evidence regarding what the "correct" reading of a text should be. Burrow and Turville-Petre's edition of Bx not only offers a new model for editing the B version of the poem, but is revolutionary in that it embeds the text in the context of the larger Piers Plowman Electronic Archive. Users can move from the critical edition to editions or images of individual manuscript copies, and they can cross-search all of this material. This is a new way of approaching texts that puts more power into the hands of users. If you just want to trust the editors' opinions and have a reading copy, then that is available. But there is much, much more if you want to dig deeper. What happens when data scientists crunch through three centuries of Robinson Crusoe?